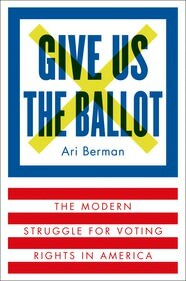 To commemorate the 50th Anniversary of the Voting Rights Act of 1965, the Asian American Legal Defense and Education Fund (AALDEF) is hosting a presentation by Ari Berman, author of the critically-acclaimed new book, “Give Us the Ballot, The Modern Struggle for Voting Rights in America” and contributing writer for The Nation. He will be joined by AALDEF Democracy Program director Jerry Vattamala to discuss the history of the Voting Rights Act, the role of courts in restricting the right to vote, and how Asian Americans and other communities of color are fighting to restore this landmark civil rights legislation. A Q&A and book signing will follow the presentation. Join us on Thursday, September 24, 2015 at 6 pm at Davis Polk & Wardwell, 450 Lexington Avenue (between E. 44 and 45 Streets) for a reception, presentation, and book signing.